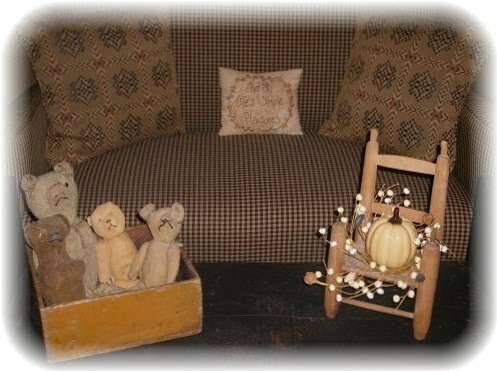 A Primitive Place ~ Tammy: Living Redo W/ New Furniture!! This post is full of photos!! LOL!! Lots and Lots of photos!! After literally Years and Years of waiting, I finally have my new furniture. I have spent hours and hours working on this room. There still is some tweaking here and there that needs fixing, but for the most part it is finished. Are you ready to see my new living room?? Well, here are some B4 and After photos for you!!! And here are a bunch more random photos of my newly changed Living Room…. Okay, now with this next photo, be honest…. Do you think I need to paint this table black?? Because I am thinking yes. It isn't as bright yellow in person, more of a mustard. But I still don't think it looks right. IMO, it jumps out at you. I think it would look better black. The mantel still needs some tweaking. I'm not really happy with it. But I'm still unsure what I want to put up there. I moved my small child's desk next to the front door. But don't worry, I didn't get rid of my big wooden house. Wanting to get a big braided rug for the center of the room. Please ignore the floating white spots. Not sure where they came from. HeeHee! Remember I warned you about going NuTs with the photos!!! Thanks so much for stopping by and seeing my changes and my new furniture. To end this post I thought I would share a photo I came across of this room. It is from Years and Years ago. Take Care and Blessings to you ALL!!! It is beautiful!! What a great job. You must be so happy! Love, love, love it! Gorgeous, I'm filled up with jealousy and utmost happiness for ya. Looks amazing, well worth the wait I'm sure. Have a wonderful Mother's Day. I love all your choices and all the tweaking....very pretty before but this is even better. As far as the gold table...I like a bit of change in color. Can you try darkening it with a rubbed stain so that the mustard/gold is reallllly dark. I think you need color. LOVEEEEEEE IT!!!!!!!. Beautiful furniture. The mustard table looks nice in that color. If you want sanded a little bit all over it and put dark walnut stain in all the piece.The piece will be darker but mantaining the mustard color. What a huge difference! I love everything you did! You furniture looks wonderful! All the tweaking you did is wonderful! I loved seeing the pictures of the Rabbit Patch! I love that darn store. I hope you have a wonderful weekend! Enjoy your new furniture! I like the table but maybe rub some dark stain over it to soften the color - then again, black always works!! Enjoy your new room!! and Happy Mother's Day!! Oh ...how prim can you get! Beautiful furniture...beautiful things! You have done a lovely job decorating your livingroom. I am so glad that I got to see the photos. Thank you so much for sharing. Wonderful, Tammy! I love your new furniture. I am sooooo wanting a sofa and I want it in the fabric that you have on the chair next to your new green cupboard. Your LR looks fabulous! I really love all of your stacking boxes, too. As far as the mustard table goes, I wouldn't paint it black if it were me. I love the color and Karen had a great idea with the stain if you want to mute it a little. I really think it looks nice as is, though. Enjoy your new pieces and congratulations! OMG Girlfriend, your room is fabulous!!! I love all your new goodies!!! That furniture is so awesome!! I was going to say to darken the table with stain too, I love a splash of color now and then! So do you just sit in there and stare? I would! Oh Tammy, it's beautifully prim!! Love the new furniture!! And everything looks great the way you have it. I agree with the others about the mustard table, I think you need that color there. Fantastic!! Your furniture is awesome. I'm so jealous......I want new furniture!! LOL!!! Everything looks amazing! I love everything. I agree keep the table maybe rub some stain on it. Love how you have old boxes stacked here and there.. I would leave the mustard table as is! It Adds a punch of something different to the whole look of the space! Love that! Your home looks so much like you now Tam! Wow..I thought the first pictures looked great and then realized they were the before pictures...The room looks awesome..maybe you should think about helping others organize their rooms. I think I love the shoes and the boxes the best. I think the yellow table looks good but then I don't have to look at it every day like you do..If you think you would like it black then you should try it black...I think it would look good either way. I think your furniture is gorgeous, but IMO don't change the mustard table! It looks great where you have it against the dark linen on the ladder. It's a great colonial contrast. You could do like a few others suggested and add a little black, but I think it is a great accent piece! Your living room looks fantastic!! I love how you have everything arranged. As far as the mustard table goes, I like it as is. I think the touch of color is a good contrast to darker colors of the furniture. Hope you have a great weekend! Tammy, your new furniture is gorgeous! The room looks great, I love every bit of it! I would definitely try rubbing a coat of walnut stain on the mustard table first.Then if you don't like it, black always looks good. I always enjoy all your photos-thanks so much for sharing with us! FINALLY!!! I'm so happy for you! You must be THRILLED! FINALLY! I LOVE, LOVE it! I'm sure your THRILLED! Wow!!! I love it Tammy! All your tweaking and the new furniture looks absolutely wonderful! I'm in agreement with all the other folks...I think the table looks great in the mustard yellow color! Love all your different collections! You have some beautiful treasures there girlfriend! Thanks for all the photos. You know us prim girls love looking at all that eye candy! Your pieces are beautiful and fit so well into your prim-pretty home!!! What a wonderful difference (before & after)! Have a wonderful weekend and a Happy Mother's day! Ohhhhhh, it looks F*A*N*T*A*S*T*I*C! You did a fabulous job decorating and picking all the right pieces for your room. The furniture is beautiful! You must wake up in the morning and just stare at that room....I know I would! Alright as for the gold table I'm with some others to say just darken it a bit either with stain or watered down black or brown paint. I like the splash of color. As for the mantle... I always like a huge mantle with pewter of course mixed with some dried flowers or redware mixed in. Great job with the rearranging though. Love your new pieces!!! I am so happy for you!!! I agree to the idea of just staining over the mustard table. Try it and if you still feel it doesn't fit you will know to paint it black. Wishing I could move right in with you....the place looks great!!! I love your new furniture! Everything looks nice, especially the new big chair. I like how you moved things around I think they suit your room perfectly. OMG what a lovely home, I like the before, but the after is better!!!! You're home looks like something from a prim magazine. If I had a home like this I would think I had died and gone to heaven!!! You did an awesome job!!! I LOVE your new furniture and how you have everything all set up. Looks wonderful! Well let me just say I got my prim fix for the day. It was like turning the pages of my Counrty Sampler Home Tour Edition for the first time. Everything is beautiful. I love this kind of furniture myself. I had to look more than once I thought I may have missed a great idea that I could use. Keep the table mustard. Absolutely love it! Not so overly done. The chairs are fabulous! I just love how your room looks...You did an awesome job..
Oh my girl I am sooooo in love with your new living room furniture! It changed the look of the whole room so much & thanks for sharing all of your prim perfect pics...I loved them all! Your home is beautiful!!! Hi Tammy Just wanted to say I absolutely love your place and must admit that the before pics are still very gorgeous. I love primitive and am new to blogspot but glad to see there are a lot of folks with that primitive taste. Your home is just gorgeous!!! I love prim black but think the muted mustard table is awesome!!! Great job!! !